Real Madrid coach Zinedine Zidane hopes Gareth Bale can maintain his fine goalscoring form - but not at the expense of his defensive duties. Wales forward Bale scored a hat-trick as Real beat Deportivo La Coruna in Zidane's first match in charge. The 26-year-old has now netted eight goals in his past four league games. "I am happy with his contribution. It isn't easy to score three goals and we hope he continues like that," said Zidane, who succeeded Rafael Benitez. 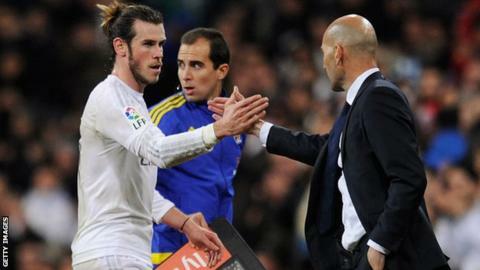 "Gareth has to do the same as everyone else. When we don't have the ball he has to defend, then when we have it he can open the game up and play on the wing. "That is what he did today." What is Zinedine Zidane really like? Bale scored a 41-minute hat-trick either side of half-time before receiving a standing ovation from the home fans at the Bernabeu when he was substituted. It was Bale's 50th league victory since arriving in the Spanish capital from Tottenham for a world record £85.3m in September 2013. Asked about his new manager, Bale said: "Everybody knows that Zidane was a great player and I'm sure he'll be the same as a manager. "We've only trained a few times but we're professionals and we work hard to try to win games and all of the titles available. "We have to carry on the same way, like we were doing before. Nothing has changed." Real, who were expelled from this season's Copa del Rey for fielding a suspended player, have not won La Liga since 2011-12. They are two points behind Barcelona, who started Sunday on top of the table, but have played one game more. Real have been drawn against Roma in the last 16 of the Champions League.